For the last two years, Jimmy John's Customer Appreciation Day has attracted hordes of hungry bargain hunters with a special, one-day-only deal for $1 sandwiches. In fact, the line for stupidly cheap subs stretched out the door and around the corner in some places, when the discount arrived last May 2. So, it should come as no surprise that Jimmy John's regulars are already wondering what the chain has in store for the occasion in 2018. Well, it turns out Jimmy John's is not offering a Customer Appreciation Day deal this year, a company spokesperson confirmed on Friday. That's right, no $1 subs (although, there's a chance some local franchise locations will offer a similar promotion). 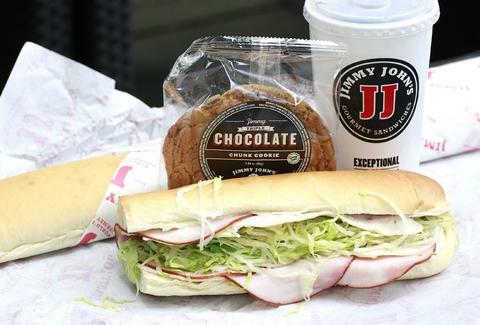 Instead, JJ's said it plans to treat its loyal cold cut cult to something different -- and potentially even bigger than dollar subs -- in the near future. There is still hope. "Jimmy John’s is not doing a National Customer Appreciation Day this year but we will have some new news and products to showcase in the next few weeks," the spokesperson said. "Please stay tuned." I’m sorry, we’re not having a national Customer Appreciation Day this year! I’m working on some new ways to show you love and appreciation, stay tuned and get pumped! Sorry not this year, but we’re working on other ways to show our appreciation. Hang tight! If you're bummed, you're definitely not alone. In the comments on a similar announcement on Facebook, Jimmy John's offered customers hugs in the meantime. Hugs are great, of course, but Hellmann's mayo-soaked sandwiches are better. All said, if Jimmy John's is cool enough to offer $1 subs in the first place, it's probably safe to trust them to do something even better this year. We'll keep an eye out for the latest and keep you posted. Tony Merevick is Senior News Editor at Thrillist and could really go for a No. 11 right about now. Send news tips to news@thrillist.com and follow him on Twitter @tonymerevick.